The image shows Bradford ‘s MPs, Parliamentarians and Bradford breakthrough members meeting recently in the Houses of Parliament. As Bradford enjoys increased profile through Bradford City’s historic appearance at Wembley, lobbying group Bradford Breakthrough is to stage a series of events inviting key national opinion formers to Bradford to show off the city’s assets. Bradford Breakthrough, which represents the leaders of the city’s key private and public sector organisations, will be staging the events throughout 2013 targeting people and organisations whose opinions are crucial in forming Bradford’s reputation across the country. The first three events will be aimed at journalists and editors from media organisations and will coincide with the Bradford International Film Festival in April, the prestigious Academy of Urbanism Conference being held in Bradford in May and the BBC Bollywood Live event in June. Other events involving tourism and investment agencies and other key groups are planned for later in the year. 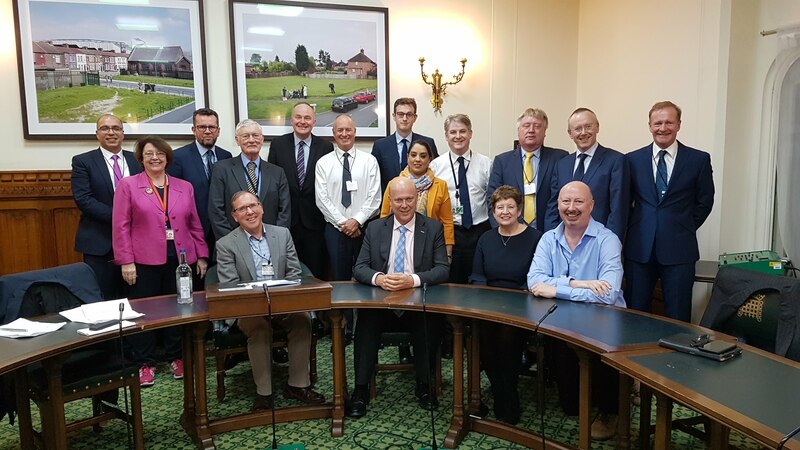 Bradford Breakthrough – the group representing Bradford’s leading private and public sector businesses – is calling for faster progress on plans to establish a rail link to Leeds-Bradford International Airport. Bradford Breakthrough members have identified a rail link to the airport as one of their three key strategic priorities for the coming year. The group believes that the recent establishment of a £1bn transport infrastructure fund for West Yorkshire provides an opportunity to bring forward plans for the rail link. The Chief Executive of Bradford Breakthrough, Colin Philpott, said “Other competitor cities like Manchester and Newcastle have much speedier and easier links to their local airports. It is vital for businesses and for local people in Bradford and other parts of West Yorkshire to be able to access their airport by rail. It is also important that Bradford specifically benefits from any rail link”. Bradford Breakthrough– the group representing Bradford’s leading private and public sector businesses – has welcomed two new organisations into membership as it develops its work of lobbying and campaigning on behalf of Bradford. The Aaagrah Group of Restaurants and Bradford Grammar School are the latest recruits to the group which represents more than 20 major organisations in the city and is dedicated to making Bradford a better place to live, work and visit and to do business and invest. The Aagrah Group, which was started 35 years ago, now runs 15 restaurants including a newly opened restaurant in Bristol – its first venture outside its West Yorkshire heartland. The Aagrah Group is based in Shipley from where it also runs an extensive outside catering business. Bradford Grammar School, based opposite Lister Park in Manningham in Bradford, is a co-educational independent school with over 1,000 pupils. Its alumni include David Hockney and the Olympic triathletes Alistair and Jonathan Brownlee.